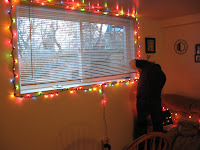 Sunday, Scott and I put up all the Christmas decorations we have. 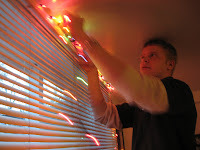 This consists mostly of Christmas lights. 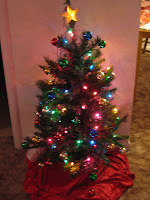 I had a little tree though--with a small string of lights and colored shiney balls to put on it. I also had some red velvet from last year's Halloween Costume (I was a pirate and the red velvet was my sash) I used it under the tree. Our apartment is very festive now with lights on both windows and our little tree to brighten up the room with Christmas cheeryness!! Can't wait!!! 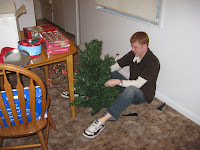 Oh, the first christmas tree pic shows that we first had a bow on the top. 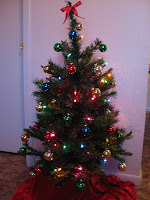 But Scott really wanted a star, so I got a little star from my star lights (used to hang in my old apt bedroom, but i haven't put them up in our new apartment yet) and put it on a yellow light on the top of the tree. I liked the bow, but I guess the star does look better.